Malleeshwaram homestay offers a simple reatreat away from the normal tourist circuit.Attapady hills are the last to be explored in kerala.Here we offer less impact tourism in its fullest meaning. 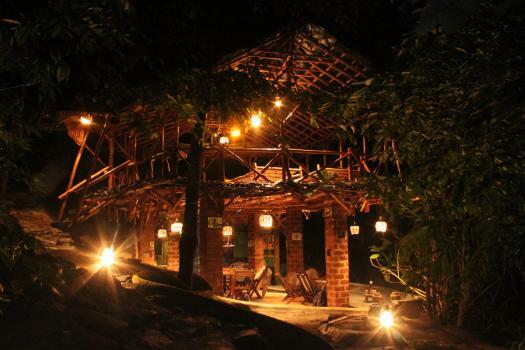 The lodge is located on a hillock near a small village called Pettickal.The homestay overlooks the vast Pettickal Malavaram,one of the largest tracks of vested reserve forests in Attapady. We have only 3 cottages,to reduce the impact on the nature and its beings around. The cottages are thoughtfully placed in a pach of protected wilderness with organic coffee,pepper,vannlla and bananas grown under natural shade. Facilities deliberately kept low to offer an altoghether different feel. Malleeshwaram homestay is an ideal geteway for the outdoors ey adventure types,also for the ones who are able to laze away...... or go birdwatching. We havint put conventional bulbs in the huts,hurricane lamps are provided instead. We serve mostly wholesome veg indian food,less spicy,the raw materials would be from farms nearby.